A composite picture showing how a typical galaxy appears at different wavelengths. The GAMA survey has measured the energy output of more than 200,000 galaxies, confirming that the energy produced in one section is only about half its value of 2 billion years ago. In short, the universe is slowly dying, scientists say. The most comprehensive assessment of the energy output in the nearby universe reveals that today's produced energy is only about half of what it was 2 billion years ago. A team of international scientists used several of the world's most powerful telescopes to study the energy of the universe and concluded that the universe is slowly dying. 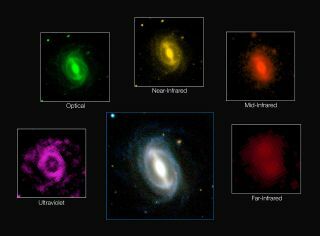 "We used as many space- and ground-based telescopes as we could get our hands on to measure the energy output of over 200,000 galaxies across as broad a wavelength range as possible," Galaxy And Mass Assembly (GAMA) team leader Simon Driver, of the University of Western Australia, said in a statement. The astronomers created a video explaining the slow death of the universe to illustrate the discovery. "While most of the energy sloshing around in the universe arose in the aftermath of the Big Bang, additional energy is constantly being generated by stars as they fuse elements like hydrogen and helium together," Driver said. Astronomers have known that the universe is slowly fading out since the late 1990s. Using several telescopes on the ground, as well as NASA's orbiting GALEX and WISE and the European Space Agency's Herschel, the team found that the energy output is dropping over 21 different wavelengths, making their results the most comprehensive assessment to date of the energy output of the nearby universe. "The universe will decline from here on in, sliding gently into old age," Driver said. "The universe has basically sat down on the sofa, pulled up a blanket, and is about to nod off for an eternal doze," he said.